If you are handy enough to attempt your own TV mounting project without help from a professional installer, take care to ensure the TV mount is properly fastened to the wall before hanging the TV onto the bracket. Mounting a TV with a tilt mount to basic drywall with wooden studs can be done by the average do-it-yourself enthusiast with a drill, tape measure, and level. Our TV mounting tips will help you avoid buying the wrong equipment, mounting your TV too high, and of course, possible TV falls. If you plan to mount your TV above a brick or stone fireplace, consulting one of our professional TV installers is probably one of the smartest phone calls you can make. Stone and brick fireplace TV mount installations are trickier than standard fireplaces with wooden studs. Our TV installers use special anchors and bolts to ensure weight compliance. We have seen and repaired many wall mount installations on brick and stone fireplaces from less experience wall mount installers that pull away from the wall after a while. The problem may not occur overnight but if not properly installed, the wall mount can gradually pull away from the wall, causing the TV to lean and eventually crash to the floor. Another very important TV mounting tip is…NEVER rely on that little built-in level that is made into the TV wall mount. These levels are more for appearance and to increase sales for the vendor than to give you accuracy for your TV installation. Use at least one professional-grade level to avoid your TV being crooked after the installation. I walk into many homes or businesses and notice that the prior TV installations seem to be too high or too low. The reason is that many people can figure out how to install the brackets onto the TV and mount the bracket on the wall but do not know how to mount the TV at the perfect height they want. All you need to follow the steps below is a tape measure, pen/pencil, TV, complete wall mount, stud finder, and level. Install the 2 mounting brackets on to the back of the TV, making sure they are the exact same height. Place the wall mounting plate onto the mounting brackets as if it would be mounted on the wall. Measure the TV from top to bottom. Write this number on your hand. Measure from the TOP OF THE TV to the TOP MOUNTING HOLES in the plate. Write this number in your hand. Measure from the TOP MOUNTING HOLES TO THE BOTTOM MOUNTING HOLES in the plate. Find the center of where your TV will be on the wall and mark a very small “M” there. Put your tape measure directly over the “M” and determine your TV height. When you are done, you will have marked the TOP and BOTTOM of your TV, as well as the TOP and BOTTOM MOUNTING HOLES for the wall plate. Run your stud finder across “1” and “2” to find the studs. If you can only find one stud, read our blog on single-stud TV mounting. Use a professional grade level to make sure the plate is level. Use the “B” as the very bottom line to install any wall plates to avoid seeing them below the TV after it is mounted. After mounting the wall plate and running the wires, hang the TV and notice how close the bottom is to your mark! We have our professional opinion of the proper height for your TV, but will mount the TV at whatever height you request. The main thing to consider is your health. The most important TV mounting tip we can give you is DO NOT MOUNT YOUR TV TOO HIGH! TVs mounted too high will cause you to lift your eye muscles to view the top of the screen for scores and other information streams that may roll across your screen. This can cause sore necks, migraine headaches and a lack of desire to watch TV. We strongly suggest keeping the TV as low as possible—especially when mounting your TV over or above the fireplace. 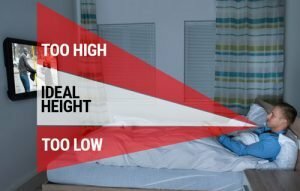 Viewing distance and furniture height can also be factors to consider when determining proper TV height. Tilting TV mounts ease the pain of mounting the TV higher than normal by giving you the ability to tilt the TV picture down at an angle. Tilt mounts can also reduce unsightly glare from windows and doors. 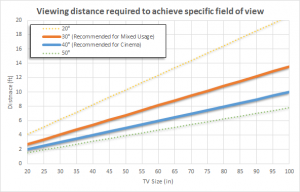 We found this article on CNET and TV distance chart about TV height very informative. You should also consider the placement of your home theater speakers. From furniture placement to the number of speakers, there are endless factors that can cause your system to perform poorly. Let us help you optimize the placement of your speakers and make your home theater system sound like you are sitting in the front row at the movies! If you don’t have a home theater system installed yet, check out our affordable options to add a little extra sound to your next movie night or home party! If you read and follow our TV mounting tips, you will be able to enjoy you own TV installations in no time. Call us to schedule an appointment for your TV installation if you need us!